Gladiators were professional fighters in ancient Rome who fought against each other and against wild animals, sometimes to the death, for the entertainment of spectators. These fights took place in arenas in many cities during the Roman republic and the Roman Empire. Gladiators usually fought in pairs, one gladiator against another. However, sponsors or the audience could ask for other combinations, such as several gladiators fighting together or specific gladiators against each other, even from the outside of established troupe. This replica Roman Gladiator arena battle helmet is similar to the one worn by Russel Crowe in his role as General Maximus in the film Gladiator. It is full sized and can be worn by most people. 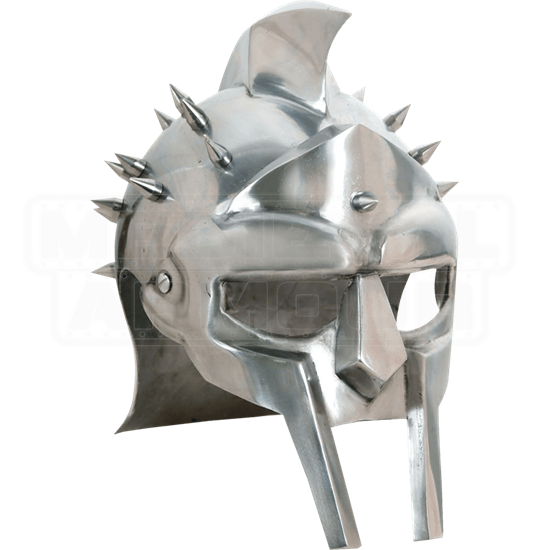 The Gladiator Spiked Helmet is hand crafted and made of 18 gauge cold rolled steel.